X-Alps is over. Honza places 3rd! Well the Red Bull X-Alps 2009 is over and it was a great race to watch. As I said earlier, this race is quite an adventure. The sacrifices these athletes make to prepare for, and participate in, this race are much more than most modern citizens will ever endure. RESPECT to all the athlete/pilots. Christian Maurer absolutely outran the field winning by almost two days margin. Alex Hofer placed second and was the only other competitor to make it to the raft in Monaco. Honza Rajmanek made a late push beyond Aiden Toase and finished a respectable 3rd place. He covered over 1150KM and had an epic journey. I really enjoyed watching this event and am proud of them all. I've carried a SPOT on my flight deck for 18 months now. It has never saved my life, but it has always been there, waiting to be activated if need be. In March I resubscribed for the 2009 season using a promotion that basically gave me a free SPOT unit for the cost of subscription (around $150). I also consider the $8/yr. GEOS SAR subscription a valuable bit of insurance that appeals to my sense that SAR service fees should be the responsibility of the adventurer who gets himself into trouble. To that end, I am taking the responsibility by insuring myself. A new SPOT promotion is now available that will, again, provide the present SPOT hardware essentially free for the price of the services. The rub is that SPOT is now asking for a 2-year subscription to qualify for the $150 rebate. Should you make the commitment at this time? Well here's my take on it. . .
as a means of communicating with my retrieval team when flying XC or in a competition. 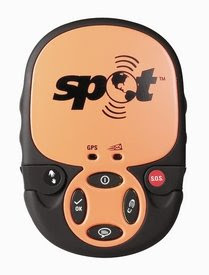 SPOT is about to offer a "NEW" SPOT unit that is smaller, lighter, and integrates some improvements that those of us using SPOTs have requested. 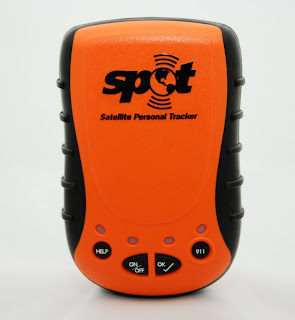 Improvements include a more robust GPS chipset and antennae, lighted buttons, additional message options, and a dedicated SPOT-Tracking button. In addition are some much appreciated indicator lights that indicate GPS acquisition and message sending lights. These improvements address some of the 'limitations' of the 'old' unit. I, however, believe that the old unit is adequate for the basic catastrophic insurance that is my primary reason for carrying a SPOT. So, should you upgrade to the new unit? If you are a 'gadget-guy' who needs to have the latest & greatest - maybe. If the unit is much better at sending messages under a canopy of trees - probably. Will I? Not for a bit. If you don't have a SPOT yet and have decided to get one, I'd think about the 2-yr. FREE SPOT Deal. I imagine that you will have the option of applying your subscription to the new unit in the future if you decide later to upgrade. Hopefully I'll get to try one out when they become available. 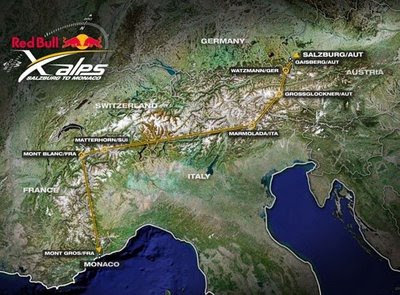 The 2009 Red Bull X-Alps begins on July 19th and 30 pilot/athletes from 23 countries, will travel 818 Km. (508 miles) from Salzburg, Austria to Monaco. The route takes competitors through the Alps on an amazing journey. Competitors will travel by foot or paraglider depending on their skills and the weather. Alex Hofer is the favorite with 2 X-Alps wins to his credit. The live-tracking available on the X-Alps website and personal blogs of the competitors (see below) will allow a view into the epic adventures. I am truly envious of these individuals who have interrupted their lives to embark on this test of their skills, physical strengths, and mental toughness. When I think about the explorers of old, Lewis & Clark, Stanley and Livingston, I am amazed at the personal suffering and commitment these men endured. The closest a 21st century man can come to this kind of adventure is a X-Alps type of journey. 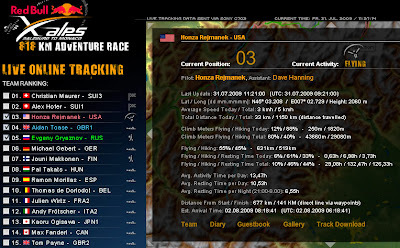 Honza Rejmanek is a California pilot participating in his second X-Alps. In 2007 he placed in the top 10 even though he started the race with a terrible stomach problem that basically put him days behind from the beginning. Fly safe and have fun Honza! I can't figure out why the gap below. . . scroll for individual blog links. Thanks to Otto Schulz for putting this info together. Well let's see. . . "The guy who has the most fun wins." I try to live by this rule. . .er, recommendation.. . . ah, tenet. But it's not easy. I mean, I AM having fun most of the time. But I'm a competitive guy, and I'd like to stand on the podium as much as the next guy. It's not that I want to get a trophy (although it's nice, before paragliding, the last I got was when I was 12). And I don't need to win so I can swagger amongst the launch queue. But I want to do my very best at the sport that has my attention. How do I do that? In short - Practice, Practice, Practice. I need to make good decisions and learn from those that aren't. One of the reasons I started writing this bloggage was so I could relive the tasks that went bad, as much as those that went well. The only way to learn from the bad decisions is to remember them. In order to plot my progress I've built a crude Excel graph of my placing in the last eight competitions. No compensation has been made for field quality or for the fact that I was on a DHV 1/2 and 2 for most of these comps. My present wing, a Gradient Avax XC2, is an EN-C (almost a 2/3) that I am very comfortable flying. I don't have any qualms flying it in angry conditions because I know what it is saying and how it will react. I also own a Boomerang 5 that I have flown a few times now. The Boom 5 has obviously better performance but isn't a wing that I enjoy flying - right now. The handling seems unresponsive and almost untrustworthy. I imagine that I will get some confidence on the Boom, with time, but until then I will be competing on the Avax XC2 - that includes the U.S. Nat's in Inspo UT in August. 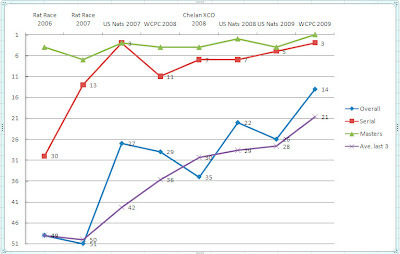 So - looking at the graph, it seems there has been some progress. I'm happy competing and learning while flying in the Serial/Sports class. I'm also getting a taste of the Boom on days that allow some altitude. Looking forward to Utah next month.